When it comes to Jewish cooking, Joyce Goldstein is considered an authority. In her latest book, "Saffron Shores," she explores the flavors and foods of Jewish cooking in the Mediterranean. The Saturday Early Show gave her $60 to create a Hanukkah meal for six. This year, Hanukkah starts Friday, Nov. 29. Many of the foods served during this period are fried in oil for symbolic reasons. The holiday refers to the battle in which the Macabees defeated the enemy and recaptured Jerusalem. Although the lamp in the Temple appeared as if it had enough oil for only one night, the oil burned for eight days. To celebrate this miracle, the candles of the menorah are lighted for eight consecutive evenings. Swiss Chard: This is a member of the beet family. It's grown for its crinkly green leaves and silvery, celery-like stalks. The variety with dark green leaves and reddish stalks has a stronger flavor than that with lighter leaves and stalks. Swiss chard is available year-round but it's at its best during the summer. Select chard that has tender greens and crisp stalks. Chard is a good source of vitamins A and C as well as iron, and can be prepared like spinach. Turmeric: (TER-muh-rihk): Used in cooking since 600 B.C., turmeric is the root of a tropical plant related to ginger. Though native to the Orient, this spice is now also cultivated in India and the Caribbean. It has a bitter, pungent flavor. In Biblical times, it was used to make perfume. Today, it is mainly used to add flavor and color. It is very popular in East Indian cooking and almost always used in curry preparations. Turmeric is also the primary ingredient in mustard. It's what gives American-style prepared mustard its bright color. Powdered turmeric is widely available in supermarkets. Saffron: The yellow-orange stigmas from a small purple crocus, saffron is one of the world's most expensive spices. The stigmas must be hand-picked and then dried, an extremely labor-intensive process. It takes more than 14,000 of those tiny stigmas to make one ounce of saffron. Saffron is used today primarily to flavor and tint food, and is integral to hundreds of dishes such as Risotto Milanese A little saffron goes a long way — thank goodness, considering how expensive it is! Saffron is marketed in both powdered form and in threads. Clarified butter: Also known as "drawn" butter, clarified butter is unsalted butter that has been slowly melted, thereby evaporating most of the water and separating the milk solids (which sink to the bottom of the pan) from the golden liquid on the surface. After any foam is skimmed off the top, the clear (clarified) butter is poured or skimmed off the milky residue and used in cooking. Orange flower water: This is a perfumy distillation of bitter-orange blossoms. Orange flower water is used as flavoring in baked goods, various sweet and savory dishes and a variety of drinks. In a saucepan, boil the potatoes in salted water. When tender, drain and mash. Add the milk, the grated gruyère cheese, the garlic, the chopped parsley, and egg yolk, and season to taste with salt, pepper and nutmeg. For the filo: Cut sheets in thirds. Brush one piece with clarified butter or melted margarine and place another piece of filo on top. Brush with butter or margarine, then place a heaping tablespoon of filling in the upper corner, and fold up like a flag, into triangles. You may also roll them up to resemble cigars and then they are called cigares or briouats: (colon here) Layer two pieces of filo with oil or margarine. Place a thin strip of filling along the long side of the filo, tuck the edges up to cover it at each end by about an inch. Now roll up like a cigar, sealing the edge with egg white. These can be completely assembled and held until you need to cook them. Cover loosely with a foil tent and refrigerate for up to 24 hours. Pour vegetable oil to the depth of 3 inches in deep sauce pan or wok and heat to 365 degrees F. Fry the pastries in batches until they are golden, turning once. Drain well on paper towels. The turmeric and saffron in the sauce create the illusion of fish bathed in golden sunlight. Place the lemon slices in a shallow bowl or platter and sprinkle with turmeric and salt. Press down on them with a fork to extract some juice. Drizzle with a bit of olive oil. In a large wide saute pan over medium heat, saute the garlic in a tablespoon of oil for a few minutes but do not let it color. Deglaze with the saffron infusion and then arrange the lemon slices on the bottom of the pan, reserving all of the accumulated juices in a bowl. Sprinkle with half the chopped coriander. Then arrange the fish fillets on top of the lemons. Sprinkle with salt and pepper, the reserved lemon juice, the rest of the coriander, and the olives, if using. Bring to a boil, reduce heat and simmer covered until fish is done, about 10 minutes. Then sprinkle with cumin. Serve hot or warm. Note: You may also layer the fish and lemon in a baking dish at bake at 450 degrees for 8 -10 minutes. Great greens to serve with fish or chicken. Even better to eat. Wash the chard well and drain. Do not worry about any water clinging to the leaves. It will enable the chard to wilt more easily. Heat the oil in a wide saucepan. Add the onions and cook for about five minutes. Add the garlic and the spices and cook for two minutes more. Then add the greens and partially cover the pan. Allow the chard to wilt down and cook until tender. Stir occasionally. Add the chopped cilantro, salt and pepper and cook for another minute. Complete the balance of seasoning with the lemon juice. This Lebanese pudding was traditionally prepared with sheets of dried apricots called amardine or apricot leather, but it also can be made with dried apricots. The latter are more consistent in quality. Dried apricots may be sweet or quite tart so you will have to adjust the sugar to suit your taste. Soak apricots in about 4 cups of water to cover overnight. Cook in the same water, adding a little if necessary, until very soft, about 30 minutes. Puree the apricots in a processor or blender or pass through a food mill or sieve. Return puree to the pan and bring up to a simmer. Stir in the sugar and dissolved cornstarch. Simmer, stirring occasionally, until thickened, about 3 minutes. Stir in orange flower water, and also lemon juice if you find the mixture too sweet. Transfer to 6 individual serving bowls. Refrigerate. If it is a dairy meal, at serving time, whip the cream with 2 tablespoons sugar, or use mascarpone. Place a dollop of cream on each pudding and top with chopped pistachio nuts. Joyce Goldstein is a chef and cookbook author. She was the founding chef and owner of San Francisco's award-winning restaurant Square One for more than 12 years. She has traveled around the world, but her interest has always focused on the countries along the Mediterranean Sea. The flavors and the foods of the countries bounding the blue waters of the Mediterranean have influenced her cooking and writing for years. Goldstein has written cookbooks about Jewish food around the world. One of her previous books focused on Italian-Jews. That book, titled "Cucina Ebraica," revealed that the oldest Jewish community in the world is in Rome. She was inspired to write that book because she lived in Italy during the late 1950s. 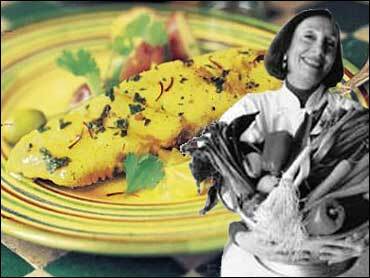 Joyce Goldstein published her first cookbook in 1989. Her best-selling books include: "Back to Square One: Old World Food in a New World Kitchen," which won both the Julia Child and James Beard cookbook awards in 1992; "Savoring Spain and Portugal" ; "Mediterranean the Beautiful" ; "Kitchen Conversations, " a trio of cookbooks highlighting the Jewish cooking of the Mediterranean region; "Flavors of the Italian Jewish Kitchen" ; and "Sephardic Flavors."